SPIDER is switched on and produces its first plasma! Representatives of Consorzio RFX, F4E, ITER Organization, ITER India, European and Italian authorities getting ready to launch the first SPIDER plasma. “Pulse on!” said the chief operator from the SPIDER Control Room and instantly the 350 guests in vast hall of the ITER Neutral Beam Test Facility (NBTF) started the countdown. 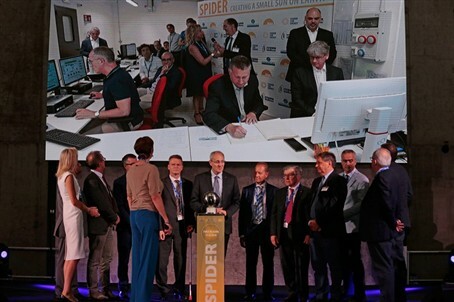 Only few seconds were left for the Director General of ITER Organization to press the button so as to trigger off the first plasma of SPIDER—the world’s most powerful negative ion beam source. A decade of research and manufacturing carried out by Consorzio RFX, F4E, European companies, laboratories, ITER India and ITER Organization were reaching a crescendo. All eyes were on stage. The tension started to build up as representatives from the SPIDER Parties together with political authorities were getting ready to make history. The cameras placed in the vacuum vessel of the beam source were now transmitting live from the core of the machine. The audience started to count 5-4-3-2-1…plasma! A spark illuminated the big screen on stage. The first SPIDER plasma was now paving the way for the one that will follow in MITICA, the real-scale ITER neutral beam injector prototype, which will be operational in a couple of years, assembled a few metres away. And MITICA, in turn, would pass the torch to ITER. The room was charged with emotion and excitement. A big round of applause, almost like a wave of energy, spread in the hall. The feeling was contagious, euphoric and uplifting. The spark they had witnessed represented years of collaboration which turned into a celebration. A dancer dressed in white moved gracefully through the audience, holding a ball on which beams of light were thrown upon and were deflected in the entire hall. A quartet playing Vivaldi’s “Gloria” filled the hall with music as the beams of light caressed the big concrete door, known as the bioshield, protecting the beam source. Slowly the door opened and revealed SPIDER almost like a hidden treasure coming to light. It was epic. Art and science, two of Europe’s finest hallmarks, fused in perfect harmony to set the tone of the inauguration ceremony. Keynote speakers praised the role of science and Italy’s role as a Host of the ITER NBTF. Francesco Gnesotto, President of Consorzio RFX, paid tribute to the members of staff, all contributors and the founding father of the facility—Giorgio Rostagni. The mayor of Padua, Sergio Giordani, welcomed the establishment of this “centre of scientific excellence” in the city where Galileo held a chair at the University of Padua. Salvatore La Rosa, representing Italy’s Ministry of Universities and Education, stressed the importance of R&D and the commitment of the new government to maintain this as a priority. Carles Dedeu, representing the European Commission, and Flavio Zanonato, Member of European Parliament, used this opportunity to remind audiences of the EU’s commitment to ITER and its potential in changing the energy mix. Bernard Bigot described this day as “an important achievement” for ITER and the fusion community. Johannes Schwemmer, Director of F4E, argued that SPIDER built a bridge between business and science. And last, but not least, Chandramouli Rotti, representing ITER India, highlighted the need of sharing technical knowhow which is essential for progress. During a round table discussion, companies highlighted the industrial benefits stemming from fusion and explained how SPIDER helped them grow, learn, expand their supply chain and become familiar with the fusion community. Charles-Antoine Goffin (Thales) described the importance to be involved in research projects in order to remain competitive. Giuseppe Taddia (OCEM) listed reputation, staff motivation and market expansion as some of the direct benefits. Fabien Siroti (ATT) mentioned how SPIDER enabled smaller companies to work with bigger ones and create partnerships. Christian Eckardt (PVA Tepla) talked about the way SPIDER offered a new level playing field in line with Big Science business opportunities. Michele Tamagnone (Delta Ti Impianti) described how SPIDER has proven to be a good school to sharpen project management skills and apply new standards. You may wonder why the ITER Neutral Beam Test Facility is a key step in the fusion roadmap. When ITER starts producing energy through the fusion of hydrogen atoms, it will rely on very powerful heating devices to achieve the necessary 150 million °C for the fusion reactions to occur. The power-horses of the ITER heating systems are two neutral beam injectors, with a third as an option during operation. Although neutral beam injection is routinely used for plasma heating in fusion devices, the size of ITER poses a set of challenges: particle beams have to be much thicker and individual particles have to be much faster to travel far into the core of the plasma. SPIDER (Source for the Production of Ions of Deuterium Extracted from a Radiofrequency plasma) will help developing this new technology. The experiment is built on the premises of Consorzio RFX, located in Padua, Italy. SPIDER also represents a unique international collaboration. Italy and Consorzio RFX have provided the facility and a large contribution towards the personnel. The team of Consorzio RFX will also be responsible for the operation of SPIDER. F4E has procured, financed and supervised the fabrication of most of the components, building on the expertise of European industry and research organisations. ITER India, managing India’s contribution to ITER, has also provided important equipment. ITER Organization, has led the design and oversight, and when it operates the ITER machine it will use the knowledge generated in the NTBF.